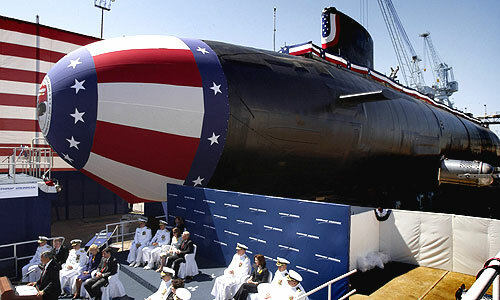 North Carolina (SSN-777) was delivered by Northrop Grumman Newport News to the United States Navy. The North Carolina is the last ship of the First Block, following the USS Virginia (SSN-774), the USS Texas (SSN-775) and the USS (SSN-776) that are already in service. Also, the brand new Virginia class attack submarine will be the fifth ship of the United States Navy to be named for the 12th state. The Virginia Class of attack submarines was developed as a cheaper alternative to the Seawolf Class. The new submarines also replace the aging Los Angeles class and were designed for a series of missions including anti-submarine and anti-surface ship warfare, special operations, intelligence, surveillance, reconnaissance, battle group support in shallow and deep water environments. Some of the main features of the Virginia class submarines is the lack of periscopes and the use of pump-jet propulsors for quieter operations. North Carolina was laid down on May 22, 2004 and launched April 21, 2007. North Carolina will be commissioned May 3, 2008, in Wilmington. it is best for all militaries all over the world to develop hi tech subs, for the waters of the ocean will be the battlefield of the future……it is truly the last frontier…. Yes the Americans sadly will be known as the litters of the seas. We will litter the oceans with russian/chinese ships,& subs. Orah! !